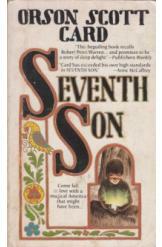 Seventh Son Orson Scott Card Sci Fi, book in a good condition, all pages intact. Come fall in love with a magical America that might have been. The aughor has created an alternate American frontier where folk magic works, and colored the colonies' history.